Dr. Efron is an associate professor of surgery and anesthesiology at the University Florida College of Medicine and medical director for UF Health Shands Hospital’s surgical intensive care units and respiratory therapy. He co-directs the Laboratory of Inflammation Biology and Surgical Science. Dr. Efron investigates inflammation and immunology in severe injury and infection. His past research includes projects that determined the importance of dendritic cells and lymphocytes to the immune response after sepsis. He was an active participant in the U54 Large Scale Collaborative Research Program, Inflammation and the Host Response to Injury. Dr. Efron performs basic and translational research, and has worked with his research mentor, Dr. Moldawer, and clinical mentor, Dr. Frederick Moore, to expand the laboratory’s well-known reputation for murine sepsis work. Dr. Efron has created novel methodologies for studying trauma and further developed the laboratory’s sepsis research to include well- known factors associated with mortality, including blood product transfusion and aging. In addition, he has led the translational human studies in trauma and sepsis at UF’s surgical intensive care unit. 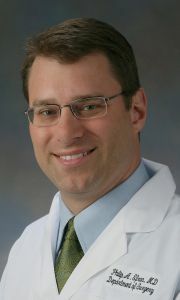 Dr. Efron has a specific interest in characterizing and understanding the expansion of immature myeloid suppressor cells in humans and animals after sepsis or trauma, a term defined as ‘emergency myelopoiesis.’ Scientists think this may lead to defects in innate and adaptive immunity and induce the morbidity and mortality seen with severe inflammatory conditions. Dr. Efron also worked with Dr. Moore and Dr. Moldawer to classify a new sepsis syndrome, persistent inflammatory/immunosuppressive catabolic syndrome (PICS), and is actively investigating this phenomenon. He has obtained transitional research funding, including internal awards from the department of surgery and external awards from the Shock Society and NIH ARRA funding. He actively collaborates with faculty in his own division, as well as faculty in the Institute of Aging and the departments of anesthesia, nephrology, pathology and molecular genetics, microbiology and the Institute of Aging. He is currently one of the principal investigators for an NIH-funded P50 center grant for the UF Sepsis and Critical Illness Research Center to study the persistent inflammation, immunosuppression and catabolism syndrome (PICS) following sepsis in surgical intensive care unit patients. Although Dr. Efron has more than 40 peer-reviewed publications and has authored multiple book chapters, he also maintains a strong clinical presence. In 2009, he became the associate medical director of the trauma ICU. In collaboration with staff, including but not limited to nursing, respiratory, nutritional, physical therapy and pharmacy personnel, he has helped engender a truly multidisciplinary and protocolized ICU. In addition, Dr. Efron established a Surgical Critical Care Fellowship Program at UF in 2010, which he currently directs. He is an Advanced Trauma Life Support instructor and has been selected for committees and leadership positions in several medical societies, including the Shock Society, the Surgical Infection Society and the Society of Critical Care Medicine. He also is a member of the Association for Academic Surgery and the Eastern Association for the Surgery of Trauma and has applied for fellowship in the American College of Surgeons. Dr. Efron joined UF’s acute care surgery section at the end of 2008. After receiving his medical degree from the University of Maryland with multiple honors, Dr. Efron completed his general surgery residency at UF, spending three years as a T32 research fellow in the Laboratory of Inflammation Biology and Surgical Science under the mentorship of Lyle L. Moldawer, Ph.D. During his tenure as a general surgery resident at UF, Dr. Efron received the Edward R. Woodward Surgical Resident’s Award. He completed his critical care fellowship training at Washington University in Saint Louis.